Welcome to the May 2017 Jewish Book Carnival -- a selection of book reviews; interviews with authors, publishers, librarians and others about Jewish books; and essays about Jewish books and literature. 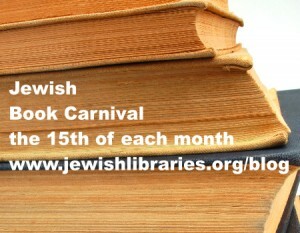 The purposes of the Jewish Book Carnival are to build community among bloggers who feature Jewish books in their posts and to promote Jewish reading, and fields supporting this reading such as publishing and library services. At The Book of Life, Heidi Rabinowitz interviews Suzanne Nelson about her teen novel Serendipity’s Footsteps. Become a patron of The Book of Life for as little as $1/month and Suzanne will send you an autographed copy of Serendipity’s Footsteps! Jill at Rhapsody in Books reviews I Dissent: Ruth Bader Ginsburg Makes her Mark by Debbie Levy. This book for children explains how Ruth's early experience of prejudice against Jews, women, and other groups inspired her later dedication to equal rights for everyone. Originally posted for Women's History Month (March), this 2017 Sydney Taylor Book Award Winner for Younger Readers is a great read any time of the year. At AJL's People of the Book blog, Kathleen Bloomfield, the president of the School, Synagogue and Center Division of the Association of Jewish Libraries addresses the current violence and hate with "literary suggestions for children that affirm the values of kindness and acceptance of others." On the Fig Tree Books Blog, a series of posts spotlighting past winners of the Edward Lewis Wallant Award continues with a look at Allegra Goodman's Kaaterskill Falls, which took the prize for 1999. I attended the Jerusalem Women Writers' Conference (JWWS) on May 9th. You can read about the great speakers and sessions at Life Is Like a Library. Over on the Jewish Book Review author Deborah Kalb shares her big secret with Rivka Levy (and you), and explains why she stopped writing for adults and started writing fiction for children instead. On My Machberet, Erika Dreifus reports on the celebration for this year's finalists for the Sami Rohr Prize for Jewish Literature (and looks back on the very first such event, ten years ago). Deborah Kalb interviews a wide variety of authors on her blog, Book Q&As with Deborah Kalb. Here's a recent interview she did with Peter Szabo about his new book, Finding Maria, which looks at his family's history and his relationship with his grandmother. from author David Samuel Levinson -- "5 Novels That Illuminate the Problems and Dangers of Anti-Semitism"
and "No Excuse for Ignorance: Books to Understand the Holocaust" by Lorraine Berry. Thank you to all our contributors. Lovely round-up. Thanks for including my review. This is marvelous--I'm especially glad to see YOUR conference update. Thank you!